Cats have captivated the imagination of people since ancient times. Felines have not only inspired novels, songs, and the visual arts, but they have also inspired magical beliefs and superstition in many cultures. Cats have been elevated to the status of deities, but they have also been deemed evil creatures. Those who own cats know first hand that cats are very complex animals. And many will agree that there is indeed something magical about cats. So if you are looking for a magical cat name, please read on. 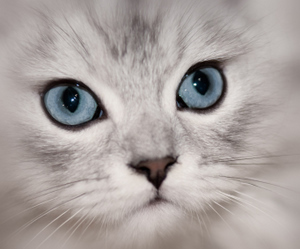 Here you will find a list of mythical cat names inspired by mythical beings. Archangel – A high-ranking angel in the spiritual hierarchy, among the best known archangels are Michael, Raphael, and Gabriel. Alma – Name of a mythical Siberian creature. The word also means soul in Spanish. Aloja – Fairies, in the Catalan tradition. Ammut – An Egyptian goddess. Anansi – The spider god in West African folklore. Apis – An Egyptian god depicted as a bull. Apollo – The Greek god of the Sun and Light, Apollo is the son of Zeus and Leto. His twin sister is Artemis. Aries – A giant, winged ram in Greek mythology. Artemis – Greek goddess of forests and childbirth. Bali – Giant king of monkeys in Hindu folklore. Bastet – Egyptian cat goddess. Bat – In many cultures, bats are considered to be vampires. Bes – Egyptian god of childbirth. Calliope – In Greek mythology, she is the muse of heroic poetry. Calypso – Name of one of the Nereids in Greek mythology. Clio – The muse of history in Greek mythology. Daphne – a nymph in Greek mythology. Diana – Roman goddess of hunting. Dobby/Dobie – A house fairy in English folklore. Dolphin – Even though these creatures are not mythical, dolphins have been revered as magical animals in many cultures past and present. Doris – An Oceanid (sea nymph) in Greek mythology. Dove – The lovely birds are considered to be magical creatures by many cultures, too. Dunnie – A shape-shifting creature in the folklore of North-East England. Estas – A giant bird in the mythology of the people of Bristish Columbia. Elvor – Forest elves in Swedish mythology. Eurale – Medusa’s sister in Greco-Roman mythology. Faun – A half-man, half-goat Greco-Roman god. Freya, Freyia – Norse goddess of fertility and war. Gaia – Greek goddess of the earth. Grendel – A sea monster, it appears in the poem Beowulf. Griffin – The word is derived from the word gryphos, which means ‘hooked’. This creature is usually depicted as a lion with wings and talons. Griffins appear in several ancient cultures, including Egypt and Assyria. Hathor – Egyptian goddess usually depicted as a cow. She is also called the Mother of Ra in Egyptian mythology. Hati – A wolf that eats the moon during the end of the world according to Norse mythology. Hiisi – A forest spirit in Finnish mythology. Horus – Egyptian god, the sun of Osiris and Isis. Ibis – Sacred bird in ancient Egyptian mythology. Inari – Japanese god of rice and harvest. Isis – Egyptian goddess of motherhood and fertility. Kami – In Japanese mythology, kami is a giant catfish who was believed to cause earthquakes. Kirin – A unicorn in the Japanese mythology. Ky-Lin – In Chinese lore, this is a creature similar to the unicorn. It is said to embody the ying-yang balance. Lama – A protective goddess in the Sumerian tradition. Lik – The Master of the Waters in the folklore of the Chaco People in South America. Lorelei – A water nymph in German mythology. Mafdet – Egyptian goddess usually depicted as a woman with the head of a panther. Maneki Neko – Lucky cat in the Japanese tradition. Morgen – Breton sea creature, similar to a mermaid. Nakki – A water god in Finnish tradition. Nara – A race of winged horses in Hindu mythology. Nereid – In Greek mythology, the Nereids are sea spirits, or mermaids, the daughters of Nereus and Doris. Nereus – One of the Titans in Greek mythology. Nyx – In Greek mythology, the goddess of night. Oberon – The king of the fairies in medieval literature. Odysseus – The hero of The Odyssey by Greek poet Homer. Orion – A giant hunter in Greek mythology. Osiris – Egyptian god of the underworld and the afterlife. Penelope – the faithful wife of Odysseus in Homer’s The Odyssey. Peri – Fairy people of Persia. Pershephone – The daughter of Demeter and Zeus, she was the embodiment of the earth’s fertility. Phoebus – The sun god in Roman mythology. Phoenix – A mythical firebird that bursts up in flames and dies, and who is later reborn from the ashes. Pixie – Mythical creatures whom some believe first appeared in Celtic folklore. Raven – This clever bird appears in many myths, including the Norse and Welsh. It is usually endowed with magical powers. Robin (Goodfellow) – The English fairy that inspired the character Puck in Shakespeare’s A Midsummer’s Night Dream. Rusalki – Water nymphs in Slavic mythology. Sekhmet – The lion goddess in Egyptian mythology. Selkis or Serket – The Egyptian scorpion goddess. Seth – The Egyptian god of the desert. Siren – In Greek mythology, a woman who is half human and half bird. Sirin – A bird woman in Russian mythology. Thalia – The Greek muse of comedy and idyllic poetry. Titan – Being of great size and strength who appears in many ancient cultures, especially in Greco-Roman mythology. Tokebi – A goblin in Korean tradition. Ulysses – The Latin name for Odysseus, the hero in Homer’s The Odyssey. Undine – In Europian folkore, a water spirit. Urania – In Greek mythology, she is the muse of astronomy and astrology. Is your cat a magical cat? A magical cat deserves a magical name. But whether you give your cat a magical cat name or a more down-to-earth moniker, consider your kitty’s physical traits as well as his or her unique personality when choosing a cat name. Keep checking back as new magical cat names will be added soon.